So far, I have almost exclusively praised the new formula editor in Microsoft Word (the lack of a convenient method for equation numbering being the sole exception). In this post, however, I will point out the problems related to the editor. One of the problems that bother me the most is related to formatting. I want my vectors (in classical contexts) in regular bold (in particular, I do not want them in bold italics!). Hence, to format a vector, I press Ctrl+B and Ctrl+I to enable boldface and disable italics, respectively. This works. But: sometimes (regularly and rather often) when I open a Microsoft Word document, I find that the vectors I added the last session are now in bold italics (even though I am certain they were in regular bold when I last saved the document)! Hence, I need to select those and disable italics (again). But after this they will (usually) remain regular bold, so I need to reapply the formatting only once. Of course, this is very annoying. It has happened several times that I have sent out or published documents with incorrect vector formatting (bold italics) at some place(s), because I haven’t spotted the problem in time. So, formatting in Word formulae is not quite WYSIWYG, but rather WYSIWYPG. The problem is that this manual override will not last. Save and open the document twice or so, and you get the (unwanted) boldface back. As far as I know, you simply cannot win this battle. A third annoying limitation is that things like mathematic superscripts do not display properly in TOCs, as we saw earlier. The previous issues are about formatting. But sometimes Word has been messing with the contents of my formulae as well. For example, it has happened quite a few times that Word has simply removed single characters from my formulae! That is really bad. However, I believe this only happens when you insert consecutive spaces manually in formulae (in order to override the automatic spacing rules), which is bad practice anyway. So now you have really good reason not to do this! The first bug I found in the new formula editor was way back in 2007. I realised that Word would refuse to save documents after you insert a formula inside a list item containing soft line breaks. Since I regularly use the save function, I stopped doing this. 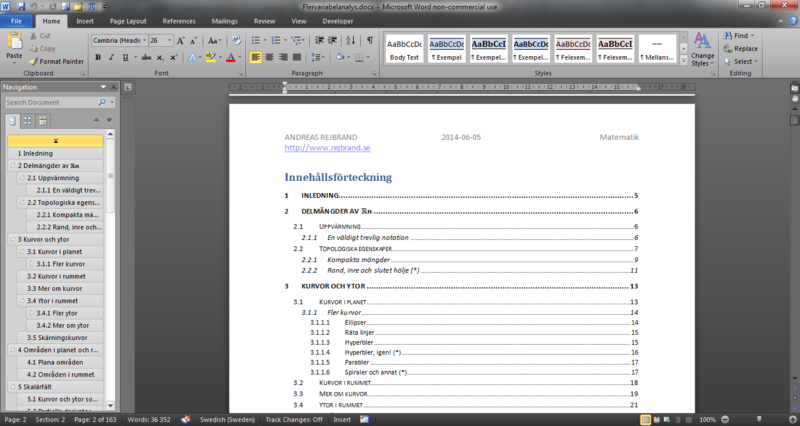 But now that I try to reproduce the bug in Word 2010, I seem not able to do that. Maybe this bug has been fixed. There are also problems related to performance and stability. For example, the new formula editor becomes very slow in large formulae. I regularly create formulae the size of a half A4 page (or larger), and then I have to wait several seconds before something happens on-screen after I insert a character into the formula. Also, formulae tend to corrupt Word documents. It has happened to me several times that Word crash when I try to insert a particular character at a particular position inside a formula. (And more often than not, this is a character that I really need to insert at that position.) The only solution is to recreate the formula from scratch.